I got into gaming in a more simpler time when video games were sold on cartridges and CDs. Since it was such a niche hobby and retail copies were limited there was a legitimate reason to pre-order games in order to secure your game once it hit shelves. I remember calling my retailer every week in the early 2000s to check when my copy of “FF9” would finally arrive. And when I eventually put the disc into my console I felt an unnatural amount of smugness from knowing I was able to play this game on day 1. But ever since my hobby hit mainstream the market has become so oversaturated with games that are all available in unlimited supply via download, that pre-ordering lost its charm completely. 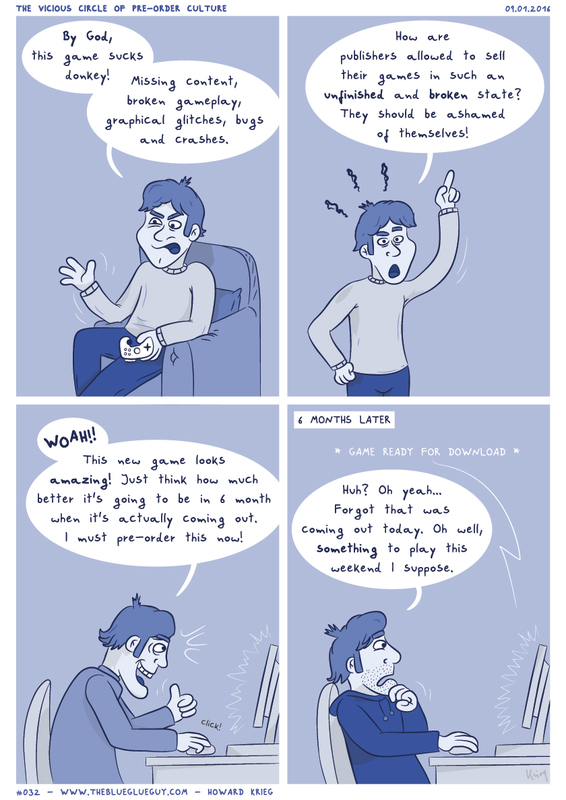 And considering so many games nowadays get released in a questionable state, it is generally a much smarter idea to be patient and just wait half a year until purchasing. By that time they’ll be sold for cheaper and will have the biggest issues fixed via patches.